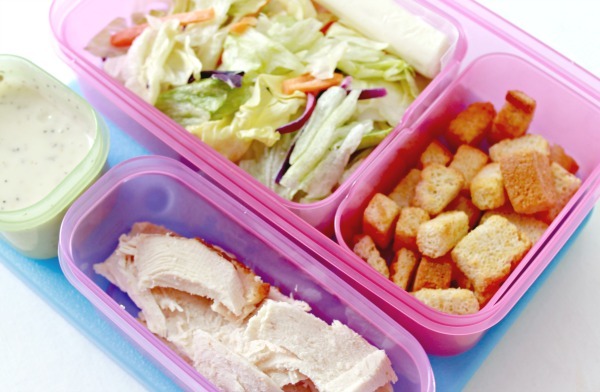 Packing school lunches…it’s the bane of most mom’s existence. 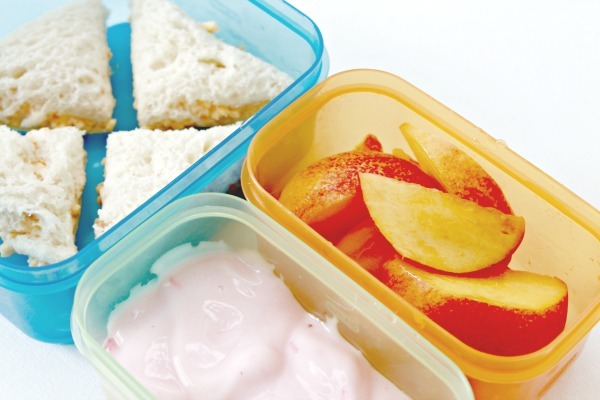 Trying to pack healthy and fun lunches can be tiresome and stressful, so Kate (my 12 year old daughter), and I came up with some fun lunch ideas that aren’t just your typical peanut butter and jelly sandwich. I mean, you can only have so many peanut butter sandwiches, am I right? Let’s ditch the sandwich all together for a moment, shall we? Kate loves pinwheels! They are basically just a flour tortilla with either cream cheese or ranch dressing spread all over them, then you add your favorite lunch meat or some chopped veggies and roll them up, then cut them into slices or “pinwheels.” These are one of our favorites…garden veggie cream cheese with ham. 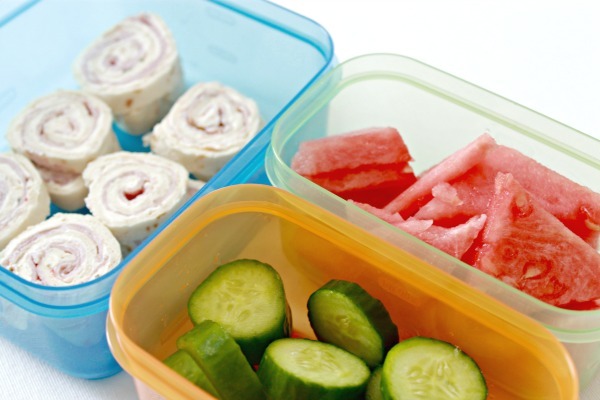 Add some slices of mini cucumbers and some fresh sliced watermelon and you have a happy, healthy and colorful lunch! Kate adores a salad that she can put together herself. I swear, if your kid doesn’t like salad, you have to try this idea! There is just something about putting it together themselves that makes it better to them. Just supply the lettuce, some croutons, dressing and slice up some rotiserrie chicken and let them make their own. I usually throw in some shredded cheese or a cheese stick too! Doesn’t it look fun? 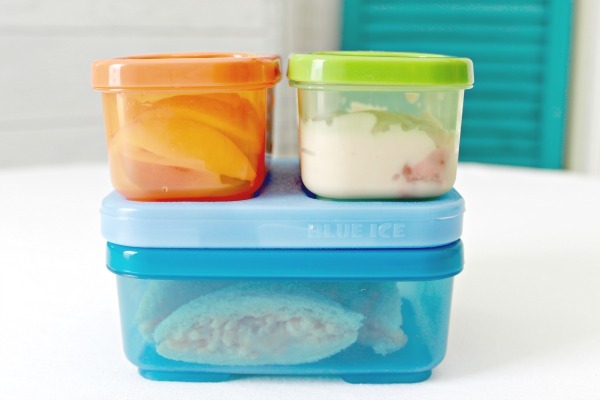 I love using Rubbermaid’s LunchBlox kids to pack our lunches. They snap together and come with a Blue Ice pack that helps keep everything nice and cold. 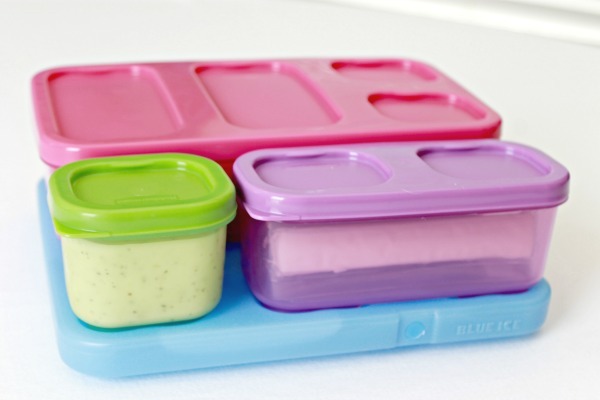 The different sized compartments snap together, so you don’t have containers turning over and spilling and the ice pack stays put too! Plus, they are BPA Free! Whoop! This one is great for the stand up lunch boxes. It’s just the right size for a sandwich and two sides. This is the one that we use for salads and sometimes even ribs ;) It has a large (sandwich sized) area along with two medium sized containers and a special container for dressing, ketchup or bbq sauce…whatever your kiddo loves! I noticed that Kate eats so much better when her lunches are fun, and now she even enjoys packing her own lunch. 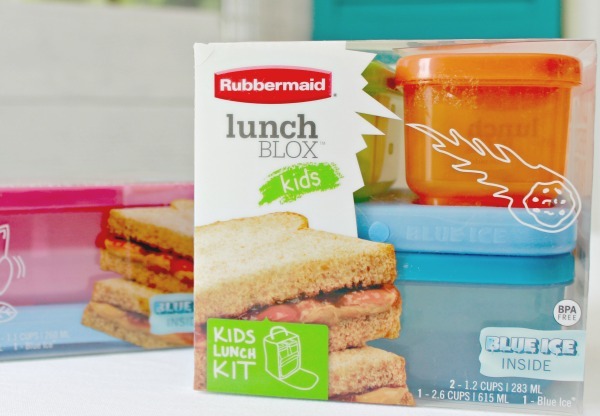 The Rubbermaid LunchBlox kids definitely make it easier, and more importantly, fun! This post was sponsored by Rubbermaid through their partnership with POPSUGAR. While I was compensated by POPSUGAR to write a post about LunchBlox, all opinions are my own.